As you may have noticed its been quite a while since I've updated the site. I've actually received quite a few emails asking why there hasn't been any activity. I don't know if that's good because I'm apparently providing a valuable service, or bad because that implies there are a lot of people that have been screwed over by Ron and the Private Sewer and Water Corp. I've also received quite a few emails from people that know Ron personally detailing more of his shenanigans, but they've asked me not to post it because they fear retaliation. The truth is I've been quite busy in the last few months and haven't had time to track and report on Ron's duche baggery. When I have looked in all the usual places, the BBB, Yelp, CitySearch, Facebook I haven't seen any sign of activity. No new complaints, no new fake positive reviews, nothing. Looks like he's even abandoned his pathetic Facebook page. Maybe he got sick of trying to hide all the comments from customer's that he's screwed over. I'm going to take it as a sign that he's finally reaping what he sowed, and is no longer in business. If everything I've heard about him ripping off vendors is true, then hopefully his credit rating will be so poor that he won't be able to start up a new business to repeat the process. If I find anything new I'll be sure to post it. And if you have new information that you want to pass along please do. 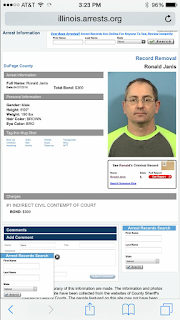 Oh, and before I forget, check out Ron Janis' Mug Shot that someone was nice enough to forward to me.